The $200,000 Pocahontas Stakes (G2) at Churchill Downs on Saturday serves as a “Win and You’re In” for the Breeders’ Cup Juvenile Fillies (G1). An intriguing field of 12 two-year-old filly prospects will go postward in this affair. Tom Amoss’ SERENGETI EMPRESS draws the rail and is the one to beat. The filly by Alternation was a 13-length romper in the Ellis Park Debutante S. last race. The $70,000 auction purchase has speed and proved last time that she can strongly finish a race. But I like another filly a whole lot in this field and will tab her for graded success. IT JUSTHITTHE WIRE is technically a maiden but will shed that tag following the Pocahontas. The Kiaran McLaughlin trainee debuted at Saratoga on August 19 and had an eventful run. 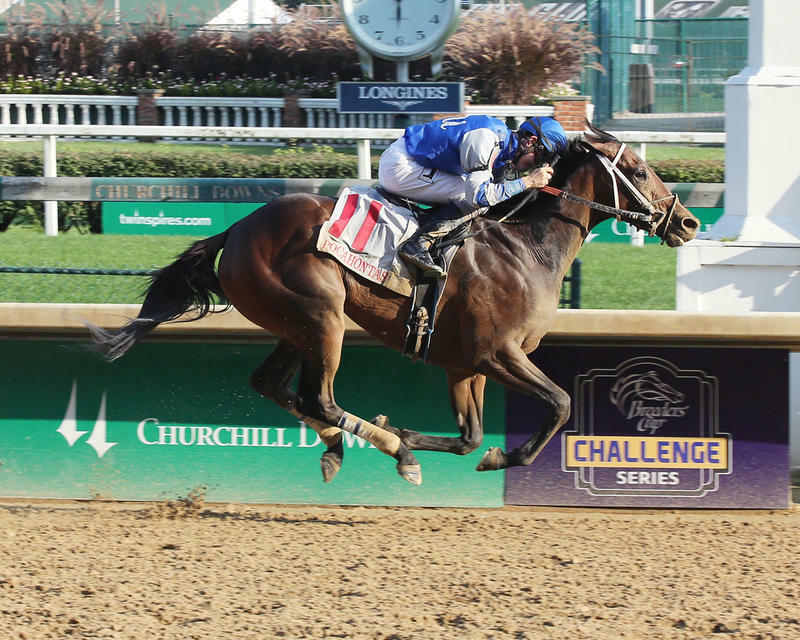 The $410,000 daughter of Bernardini broke slowly but got a fine education in the six-furlong bow. The Kentucky-bred was well back early over a speed-favoring surface but showed class in getting in contention at the top of the lane after racing in traffic. It Justhitthe Wire found clear space after moving outside in midstretch and crossed the wire first in a three-horse photo. While the well-meant filly was disqualified and placed third, she impressed me enough to get the nod for the Pocahontas. The gray showed me that she can close from off the pace as well as overcoming adversity. Not many debuting juveniles can accomplish what she did. Her trainer McLaughlin is one of the better conditioners in the game, but his prowess doesn’t often come with first-time starters (he is 23% second time out, though). So for the January foal to run like she did at the premier meeting in the nation on debut says a lot to me about her as a whole. The pace of the Pocahontas will almost certainly be a fast and contested one. With speed on both her inside and out, I think It Justhitthe Wire could track near midpack before pouncing inside the final quarter-mile. Joe Rocco, Jr. inherits what could be a fine mount today.